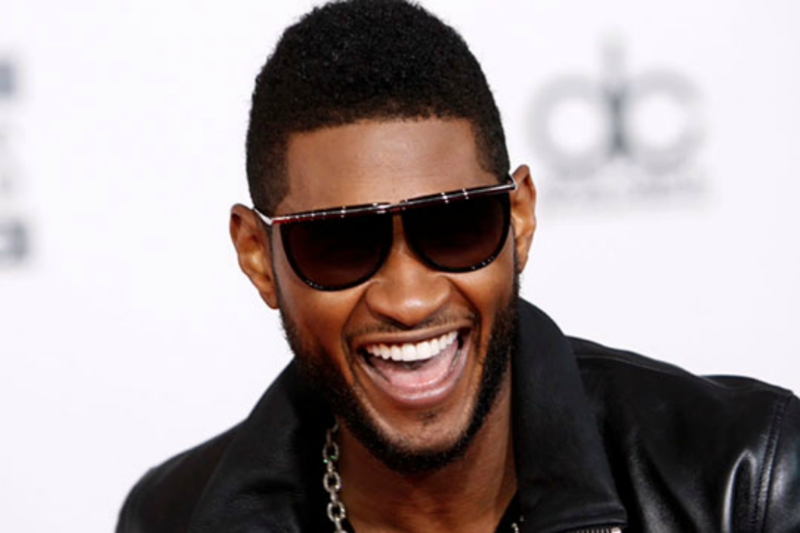 Usher Married, Wife, Kids, Height, Net Worth, Bio, Is He Gay? Home Musicians Usher Married, Wife, Kids, Height, Net Worth, Bio, Is He Gay? Usher sang and danced his way into the music consciousness of many people in the 1990’s. He has held a special place in the music industry since then even when he is not continuously dropping hits or putting on shows. He has had a massive career filled with numerous successes. He was born in Dallas, Texas on the 14th of October 1978. His parents are Usher Raymond III and Jonetta Patton and the two raised their son in Chattanooga, Tennessee before finally moving to Atlanta, Georgia. Jonetta Patton identified her son’s singing talent early on and by the age of 12, she began signing him up for local singing competitions. It was in one of these competitions that Usher caught the eye of an official from LaFace Records who saw the talent in him and decided to groom him. In 1994, Usher released “Usher” and got into the music scene. It was, however, his 1997 album “My Way” that he caught the attention of the public with. My Way gave him his first U.S. Billboard Hot 100 number-one single in the song “Nice & Slow”. The song “U Don’t Have to Call” of the My Way album also gave him a first top-three single and the album sold 8 million copies worldwide and got the now-famous singer two Grammy Awards in 2002 and 2003 as the Best Male R&B Vocal Performance. His 2004 Confession album finalized his rise as one of the top and best-selling artists from the 2000s. To date, the album has received a Diamond certification by the RIAA. Usher has made successive Sexiest Man Alive lists since he came on the music scene. He has been referred to as everybody’s favorite ex-boyfriend after dating such prominent people as model Naomi Campbell and TLC’s Chilli Thomas. Despite his ever-evolving dating life, he has only given up his singlehood for two women. He got married to Tameka Foster on August 3, 2007. Tameka Foster had been Usher’s personal stylist for years before their relationship turned romantic in November 2005. The two had an initial wedding on the date stated above in Atlanta but followed it with a larger ceremony at the Chateau Elan Winery & Resort outside Atlanta on the 1st of September 2007. Tameka Foster came into her union with Usher with three sons from previous relationships. Usher, therefore, became a stepfather before he and Foster then had two sons of their own whom they named Usher “Cinco” Raymond V and Naviyd Ely Raymond born in November 2007 and December 2008 respectively. Foster, unfortunately, suffered a cardiac arrest two months after the birth of their son in February 2009. She had gone to São Paulo, Brazil and was given general anesthesia in preparation for a cosmetic surgery when the cardiac arrest occurred. Usher canceled a performance and flew down to be with his wife. In June 2009, however, he filed for divorce from her in Atlanta. The divorce got finalized on November 4, 2009, and the two entered a very public custody battle for the two sons that they had together. The custody battle stretched for three years and Usher was finally awarded primary custody of their sons. Tragedy struck on July 8, 2012, when one of Foster’s sons and Usher’s former stepson, Kile Glover, at 11 years-old was declared brain dead when he was struck by a personal watercraft on Lake Lanier. He died on July 21, 2012. It was only a little over a year later that Usher’s eldest son was hospitalized following an accident in a pool in his home where he got stuck in a drain. Foster filed a request after the accident seeking temporary primary custody, citing their son’s near-death accident as proof that the children were not being properly supervised. The case was dismissed at the hearing on August 9, 2013. Usher got married to his longtime girlfriend Grace Miguel, who also doubled as his manager, while the two were vacationing in Cuba in September 2015. The marriage was quiet and their status as husband and wife was only a subject of speculation for a while after a picture on Instagram by Miguel showed Usher with a gold wedding band. He later confirmed their marriage while on the Ellen DeGeneres Show. The couple informed US Weekly of their separation on March 6, 2018, although they maintained that they were still on friendly terms and would support each other in the next phases of their lives. All the people that Usher has been paired with in relationships over the years have been females. However, after some documents were leaked online alleging that Usher had infected a partner with Herpes in 2012, a number of other accusers started to come out against the singer. One of the three accusers represented by attorney Lisa Bloom who was suing Usher on allegations of sexual battery, fraud and more was a male. The male plaintiff chose to remain anonymous making it difficult to verify that Usher has ever had relations with a man. Usher stands at a height of 5 feet 7 inches. The widely accepted ladies man has a body to die for so he wears his height splendidly with impeccable abs and a weight that is just around 75 kg. Usher puts in a lot of work both in the gym and through dieting to ensure that he always looks as good as he does. In 2011, Forbes magazine put Usher on their Celebrity 100 list at number 32. It had been after his OMG Tour and the singer was reportedly worth $46 million which also had him on the “The World’s 25 Highest-Paid Musicians” list. This is unsurprising considering the singer has sold over 23.8 million albums and 38.2 million digital songs in America alone. He also owns a record label with famous talent manager Scooter Braun named Raymond-Braun Media Group (RBMG). The label includes Justin Bieber who Usher helped to groom in the music business. Currently, the singer’s net worth is put at $180 million.